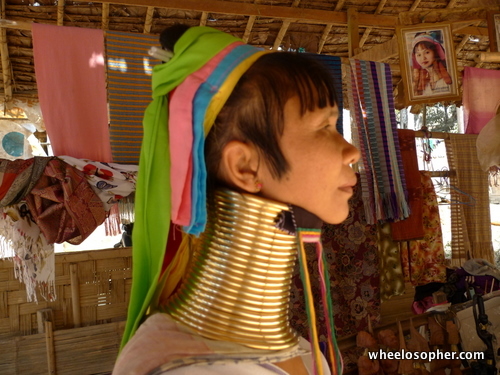 April 2, 2010 April 4, 2010 North Thailand, Mar 2010 2 Comments chiang mailong-necked karenmae hong sonnorthern thailand. Day 6, 4 March. 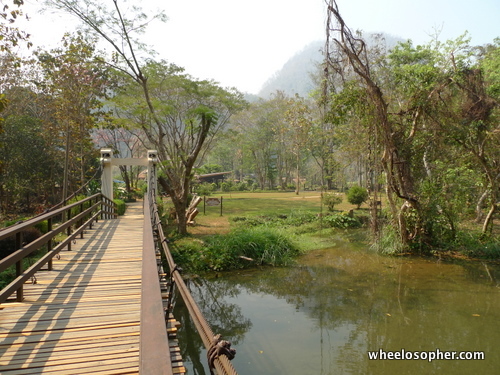 Exploring Mae Hong Son. 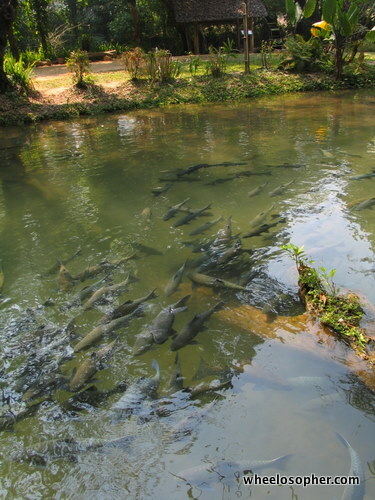 Besides the 1,864 bends that Mae Hong Son (MHS) is famous for, there’s a couple of other oddities that are only found here, and which draw in the tourists by the busloads. One is a certain species of fish that live in a cave, and the other an ethnic tribe whose womenfolk consider it a thing of beauty to have their necks elongated by heavy coiled brass rings. Mo was particularly piqued by the long-necked women, and he absolutely had to see them. This morning, by the time we had woken up, Roland had already left for Pai just after 7am … yes, Pai, approximately 110 km away. Not too long after lunch, we got a call from the Man himself telling us that he had arrived at Pai. It was about 3.30pm, which meant it only took him about 8.5 hrs to ride all that distance — loaded panniers, punishing uphills, downhills, coffee breaks, photography stops and pee stops not withstanding! Well, we are talking about Roland after all. Back at sunny, hot and haze-covered MHS, we were already out on our rented motorcycles after another Thai breakfast at the local market. We never ceased to be amazed by all the wonderful colour and smells that always surround local markets, and this one was no different. 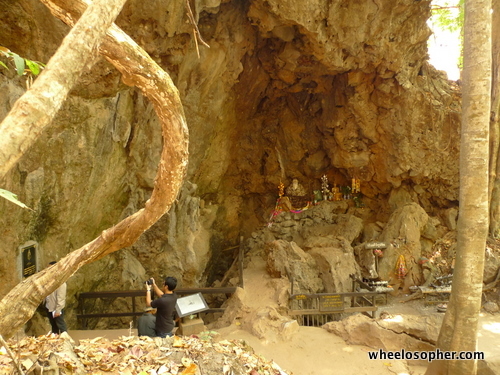 The first stop of the day was the much-touted Sacred Fish Cave, located inside a national park about 17km from town, along the same road we had ridden coming from Soppong. I had expected a tourist trap but it turned out to be otherwise. A bored-looking park official greeted us as we walked up to a booth fronting a pathway leading to the entrance of the cave. When asked how much, he merely pointed to a box marked ‘donations’. Well, well … no overpriced rip-off here. Nice. 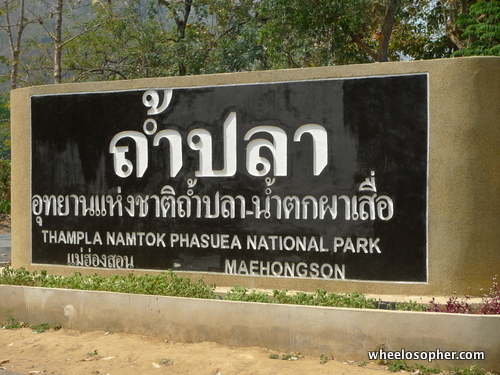 The entrance to Thampla Namtok Phasuea National Park...try saying that in a hurry. As we walked in, following the signs that led to the cave, we were again surprised by the beautiful surroundings — well-kept, grass neatly trimmed and an idyllic stream flowing between the trees. 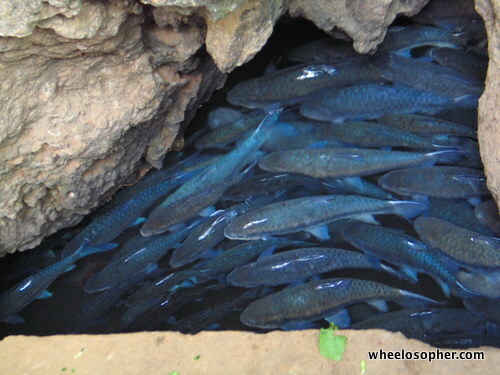 The stream was unlike anything I’d ever seen before — it was teeming with greenish-blue coloured fish, some of which were almost 3 feet long. It looked more appetizing than sacred to me. Being a sacred fish does have its advantages … no worry of chomping on nasty hook-disguised bait, plus all the fish food it could eat. All it had to do was swim around and awe dumbstruck visitors. The sacred fish. The water source is probably subterranean. This is just in front of the cave. Where the man with the camera is standing, in front of the railing; that's where the viewing hole is. Next on the list was the visit to the Karen, and it was a long, long ride to the long-necked village — more than an hour of non-stop riding over hills and dales. Shang couldn’t hack the long, hot ride; so he decided to peel off halfway through and went hunting for a long lunch in an air-conditioned shop somewhere. Finally, after a short stretch of bumpy, dusty trail, we reached the Karen village. ‘Disappointing’ doesn’t even begin to describe the experience. It wasn’t a real native village — it was nothing more than a refugee camp. And they actually charged 250B just to walk around some dilapidated wooden and bamboo houses. 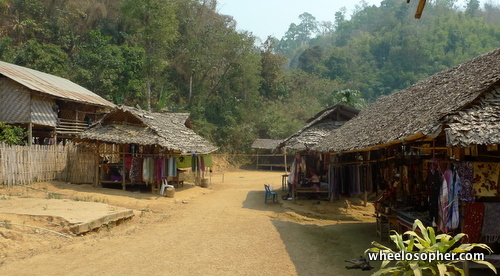 I suppose the gawking at the long-necked ladies would have made it worth our while, but the rest of it really turned me off — the many stalls lining the village’s single dirt road selling the same old tourist stuff, the unsanitary conditions of the whole village …. there was such a sense of hopelessness in the air. From what I had read, these displaced people whose homeland is actually Myanmar, were caught in between a rock and a hard place. The Thai government weren’t very sympathetic to their plight, and their own government persecuted them. 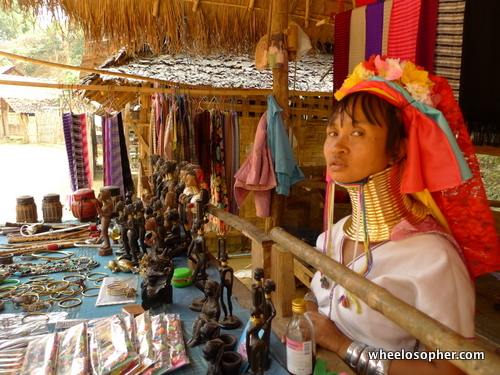 On the other hand, the long-necked womenfolk are actually contributing to the Thai tourist industry. You’d think the Thais could do a little more for them. And from the looks of it, one wonders how much of the 250B per head gawking-fee actually goes back to them. The entrance to the long-necks' 'refugee camp'. Just to the left of the entrance, a sleepy-head manning a counter collected the 250B from us. Outside there a few army personnel hanging around. 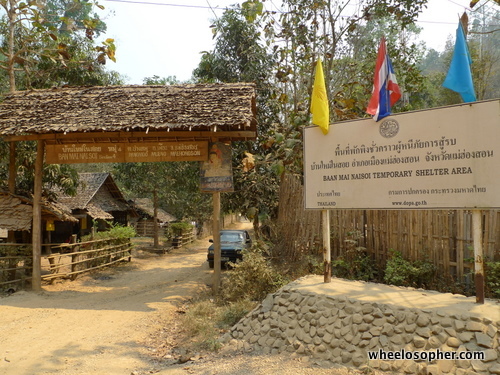 Baan Mai Naisoi is one of the 3 villages open to tourists. ... all manned by lovely ladies like these. More than half the stuff came from some souvenir factory somewhere. Once you had your camera up, these ladies would oblige with well-practiced poses. 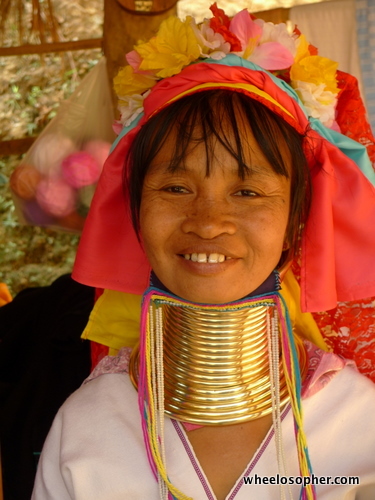 Women of the various Kayan tribes identify themselves by their different form of dress. 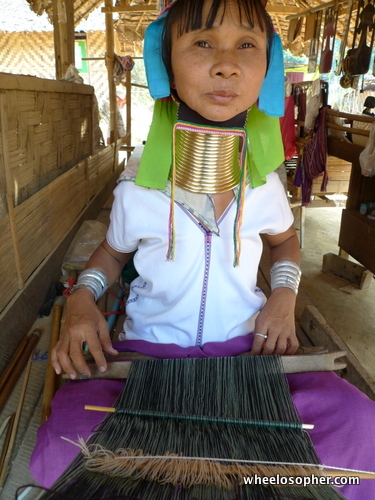 The Kayan Lahwi tribe are the most renowned as they wear ornaments known as neck rings, brass coils that are placed around the neck. These coils are first applied to young girls when they are around five years old. As each coil is replaced with a longer one, the weight of the brass pushes the collar bone down and compresses the rib cage. Contrary to popular belief, the neck is not actually lengthened; the illusion of a stretched neck is created by the deformation of the clavicle. Many ideas regarding why the coils are worn have been suggested, often formed by visiting anthropologists, who have hypothesized that the rings protected women from becoming slaves by making them less attractive to other tribes. Contrastingly it has been theorised that the coils originate from the desire to look more attractive by exaggerating sexual dimorphism, as women have more slender necks than men. It has also been suggested that the coils give the women resemblance to a dragon, an important figure in Kayan folklore . The coils might be meant to protect from tiger bites, perhaps literally, but probably symbolically. In between tourists, what else was there to do? 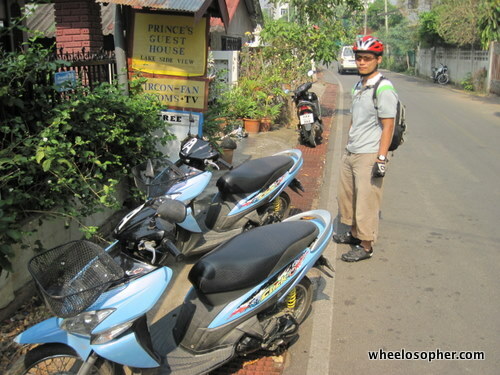 By this time, we had already decided on our next course of action for the rest of the trip — Shang, Mo and I would ride to Soppong, sans panniers, of course, while Terence and Philip will ride shotgun in the Mitsubishi Triton pickup that we had hired to take us all back to Chiang Mai (4,500B). 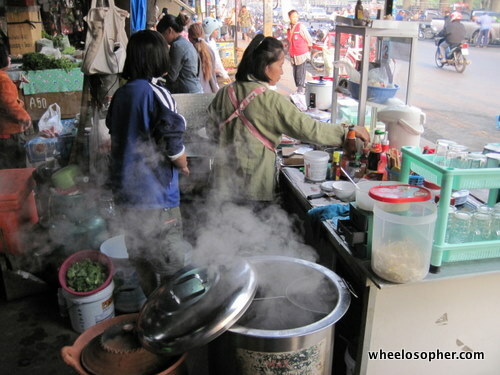 At Soppong, we’d regroup and then we would all squeeze into the pickup and drive back to Chiang Mai. It was not going to be a race … we promised each other.